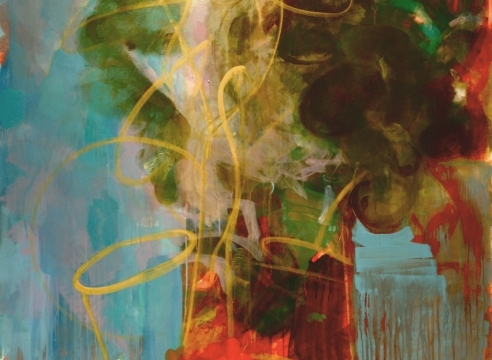 Eugene painter Jan Reaves explores abstractly the essence of elements found in the natural world. 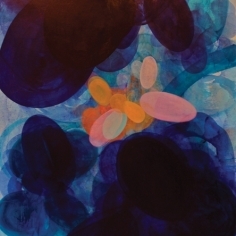 Using a vocabulary of gestural line and shapes, she connects with an idea or an object, and paints using a process of exploration and discovery. Reaves says, “through the material of paint and gesture, I explore the seen and unseen parts of the world around me. I search for that “something” in the making of a painting that synthesizes and fixes the experience of the actual, illusive, and transient mysteries of our environment into the illusory space of a painting. I think about painting as a construction, a personal fiction.” Open-ended, Reaves’ outcomes have no easy interpretations, leading the viewer ultimately to the work’s richly enigmatic and haunting qualities. Northwest artist, Jan Reaves received her MFA from the University of Oregon in 1983. She has shown her work over the past 30 years in numerous group exhibitions, nationally. Her work has been included four times in the Oregon Biennial since 1985. Other exhibitions include Western Oregon University, Monmouth; Western Michigan University; Kalamazoo; St. John's University, Jamaica, NY; and the San Jose Institute of Contemporary Art, CA. She has won various awards including the Juror's award for the 2001 Oregon Biennial at the Portland Art Museum. She has taught art throughout the Northwest and at U of O since 1998. Most recently, she was included in The Long Now, a faculty exhibition at the Jordan Schnitzer Museum of Art, University of Oregon in Eugene, which was accompanied by a color catalog. Across the work, Reaves balances bravura gesturalism with an overarching judiciousness in paint application and color.